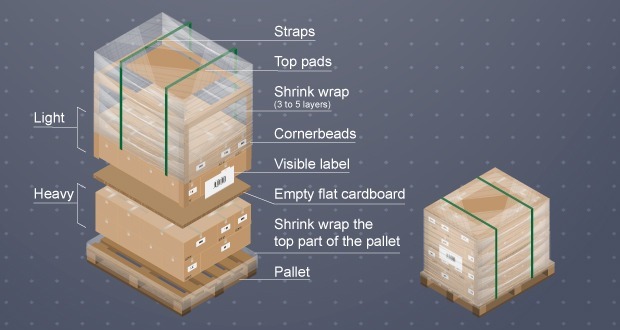 Click here for a printable version of this Pallet Shipping 101 article and here for a PDF version of the How to Pack, Palletize, & Prepare Your Freight Infographic! Preparing your freight for shipping is very important to avoid any surprise upon arrival. Let’s review how to pack a pallet and package your freight. Carriers’ job is to move your freight from A to B, not to prepare it for shipment. So package your freight as well as possible. Package your products and pallet for strength: Your products can be damaged on the inside of each box, on the pallet, and from other pallets. So protect it from the inside out. Use quality packaging materials. This is very important, especially if you’re a new shipper. It’s worth the extra time, work and cost. Use enough tape otherwise it could open in the middle or tear off on the edges. Make sure boxes don’t overhang or aren’t misaligned on the pallet, otherwise, the pallet can act as a bumper or boxes will move and be damaged. 7. Option to strap it to the pallet with a nylon strap to help even more. Is this information available in a poster form or a printable PDF? Hi Mike, thanks for asking. I hope this helps! All the best! !